Do Rabbits Eat During the Night? Rabbits belong to the family Leporidae, which includes 54 different species of these small mammals. Rabbits live in various types of habitats, including swamps, grasslands, mountains, forests, tundras and deserts. Within these habitats, rabbits are herbivores and feed on grasses, plants, roots, bark and fruits. To avoid being hunted, rabbits developed a unique feeding behavior. Rabbits are crepuscular feeders. This means that they prefer to leave their burrows to feed on nearby plant matter around twilight hours. This feeding behavior prevents them from falling prey to common daytime hunters like foxes or skilled night hunters like owls, since the difference in lighting makes it hard for daytime and nighttime hunters to adjust their vision. Hunting at twilight is also preferred by rabbits who live in hot deserts, like the desert cottontail. This is because the sun is not at its brightest and does not provide additional heat stress to the rabbits while they munch on plant matter. When caring for a rabbit as a pet, food and fresh water should be available to him at all times so he can feed as he desires. Hay should be available daily, as well as 1/4 cup of pellets for every 5 pounds that your rabbit weighs. Rabbits should also be given vegetables like lettuce and clover on daily basis. House Rabbit Society: True or False? 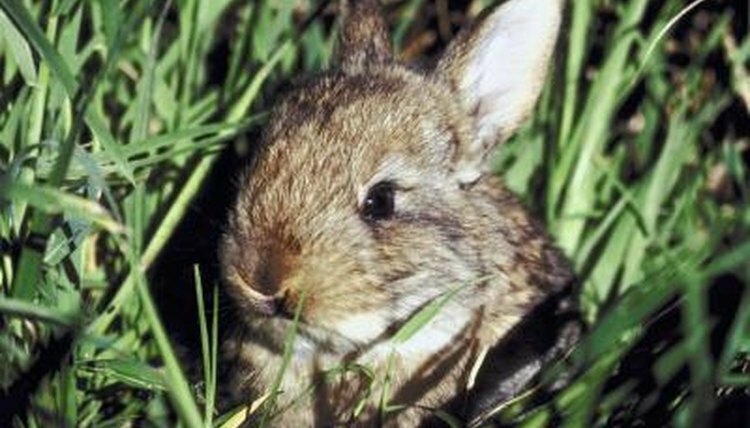 What Does a Young Cottontail Rabbit Eat? What Kind of Milk to Give Newborn Bunnies? What Happens to Rabbits in the Winter? What Happens If a Rabbit Eats Cat Food? Should You Leave a Light on for a Rabbit at Night?